Today marks the birth of American independence. While it took collaboration, respect and strategic thinking to persuade Continental Congress to formally adopt the Declaration of Independence 241 years ago, the impact and importance will forever be remembered throughout history. This is a lot like influencer marketing (although, Congress will not be involved). Just like the Declaration of Independence, it has taken a long time and a lot of work (on the part of marketers and journalists) to get influencer marketing where it is today. 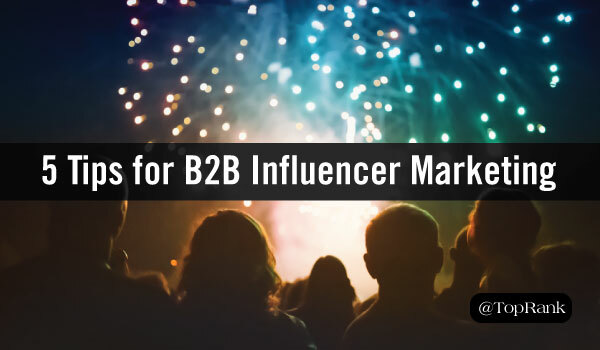 In a recent report conducted by Traackr, Altimeter Group and TopRank Marketing, data shows that only 15% of B2B brands are running ongoing influencer programs, which opens up huge opportunities for the future of B2B brands and influencer marketing. With primary objectives like increased brand awareness and reach and driving lead generation, influencer marketing is a highly strategic marketing tactic that is rising in the ranks for B2B many brands. It’s a known fact that influencer marketing should be implemented, but how can you successfully execute ongoing influencer relationships? The first misstep is very common and proves to be misleading for many brands because often times, influence is equated with the number of followers, fans, and likes an influencer has. It’s tempting to look to celebrities and other popular figures to increase reach and awareness, but this isn’t always the most effective option. TIP: Identify influencers whose brand goals and objectives align with yours. Micro-influencers, those who have a smaller following, but are more focused on a specific topic, can be very powerful collaborators who can make strong connections with your audience. One way to implement an influencer marketing campaign is to ask for a contribution via a guest blog post. While technically this is seen as influencer marketing, you probably won’t get the results you desire. A guest post alone won’t help educate and inspire your audience, you must do more. TIP: Use an integrated approach to the content campaign with your influencer. Give them guidelines and ask them questions. Use their answers, in their own words, and employ social media to amplify the co-created content. This touches on a much larger topic that influencer marketing is transactional. I hate to break it to you, but the money driven, pay-to-play approach isn’t a scalable model. Often times, influencers are turned off by this type of interaction. TIP: Instead of putting a price on the influencer engagement, think of it as a long-term relationship. With each interaction, social mention, personalized email and in-person contact, you are strengthening that relationship and helping it grow. It could be as simple sharing content to your network that the influencer has created previous to your partnership. For many of your marketing efforts, your brand will have complete control. However, having the ultimate cosmic power will likely get you trapped in a little genie bottle where you’ll be stuck on a lonely island with no influencer contributions. TIP: Let loose the reins a little bit and set guidelines and clear expectations for the influencer, but give them some control over the messaging and design. The influencer has a committed following who is familiar with their brand, don’t confuse the audience by imposing. Stopping the communication after the close of a campaign will make more future work. It’s common for B2B brands to end communication with the influencer after the campaign. The time and energy you spent nurturing the influencer will be wasted if this happens. It’s the “one and done” mentality, and no one likes the feeling of being used, and neither does your influencer network. TIP: Keep the communication channel open and use an ongoing approach to your influencer marketing program. Share the co-created content and send pre-written messages to your influencer so they can share it with their networks on various platforms including social media. Thank your influencer for their contribution and continue to nurture the relationship, even after the campaign is over. Influencer marketing is an essential component of any successful B2B marketing strategy. To stand out amongst the competition, it’s important to approach influencers with tact and respect. Heeding the advice of these 5 marketing experts and influencers, and focusing on the relationship, rather than the result will help your brand thrive in the B2B marketplace. Need Help Incorporating Influencer Marketing? We’re here for you. Contact TopRank Marketing for help declaring your independence from bad influencer marketing.